By GreenEyedLillies on August 23rd, 2008 . Filed under: Accessories . 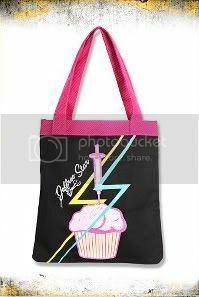 This black tote features a cupcake with a frosting filled needle and a Jeffree Star logo. Pink trim. Inside includes 3 pockets. 14″ x 15″. Imported. By Loungefly. I need some help. I am crazy for anything cupcake, and I need to know where to find an item I saw at my daughter’s school. It was a cooler/lunch tote in the actual shape of a cupcake. The top of the cupcake zipped open, and inside you could put your goodies, lunch, etc. It was silver and pink with a big cherry on top, and had pink adjustable straps. It was about 10 or 12″ in diameter. It is silver and pink…looks just like a giant cupcake…made of stuffed fabric, metallic decorations, and a big red cherry on top. I have been all over the internet for 2 days, and have had no luck finding anything even similar. The student said she got it as a gift, and didn’t know where it was purchased. It had a single tag inside with the name Cindy Kirk. I have looked the name up online to no avail. I need help, I can’t find it and I have to have it. Does anyone out there know where I can get one, or something like it…. or has anyone seen it at a certain store or something? Please, Please let me know. Any info would be greatly appreciated!!!!! I am also looking for the cupcake cooler/lunch tote for my granddaughter. We had one, but the dog chewed it up. We originally bought it at a store called Libby Lou’s in The Woodlands, Texas, but the store has since closed. I don’t know if there are any other chains out there. I’m still looking. Is that the wonderland bakery cupcake lunch tote. Someone is selling it on amazon.com for $34.95.